Do you need assistance or wish to discuss applications ? 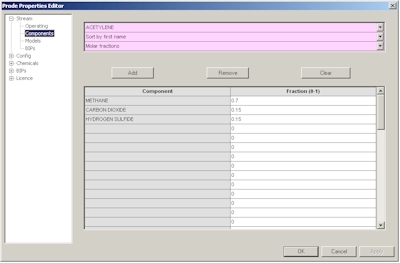 The Stream editor includes several pages, from the first page you can select a stream (Properties can store all the streams required to define a medium size plant) solve a series of flash operations and see the resulting compositions in the different phases, in this page select the stream you wish to define, for example the first. In the third page you can define the package (thermodynamic models and related options) , here we define API Soave Redlick Kwong. 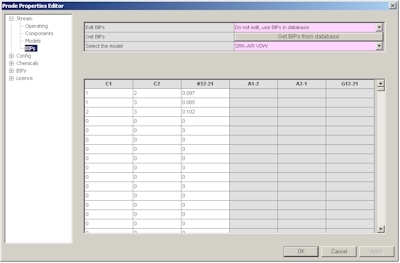 The fourth page provides access to BIP (Binary Interaction Parameters) for the different models, you can enter specific values or click on "Load BIPs" button to get the predefined BIPs from databank. Finally we must save the new data, in the first page click on "Save" button, note that you can redefine the name of the stream as you wish (editing the cell near the button "Save"), you can define / modify many streams following the procedure described. 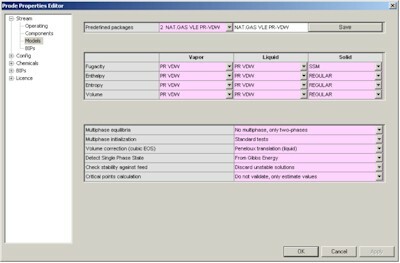 here you can select the units which you need for a specific problem, in this example for the pressure (first row) select Bar.a , notice that unit for temperature is K (but you can set the units which you prefer) then click on Ok button to accept new values and leave the Properties editor. 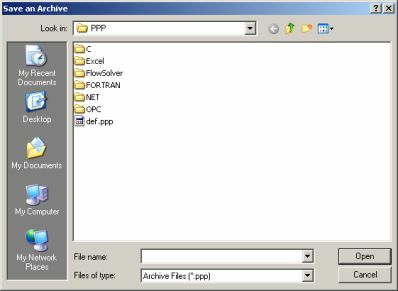 Now you are ready to use Properties for calculating all the properties which you need, however there is still a last thing to do if you do not wish to lose all data when leaving a Excel page, precisely to save data to a file, to save data to a file from Excel Properties menu select "Save a Archive"
Properties saves on the file also the units of measurement so you can define different streams and different units in different projects. Now you can calculate all the properties which you need with the units which you prefer for all the streams defined in that project. Second step: calculate properties in Excel cells. In B1 we enter 200 as temperature (remember we have K as unit) and in B2 we enter 5 as pressure (remember we have set Bar.a as unit), densities are in Kg/m3 , notice that when you change B1 or B2 Prode Properties recalculates these values. 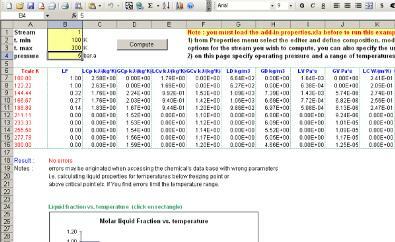 Now you can modify the stream 1 (changing the list of components, the compositions or models) or the units of measurement and Prode Properties will calculate the value of densities and liquid fraction accordingly, in this way is very easy with Excel to solve many different problems leaving to Prode Properties the task to calculate all properties for pure fluids and mixtures. in Matlab (as In Excel) you can access the Properties editor from menu associated with the figure. Herebelow a short list of the properties available, read the operating manual for additional information. Third step: calculate tables of values and print graphs. If you wish you can modify the stream composition or the units of measurement , in that case, as before from Properties menu access the Properties editor and modify the previous data. 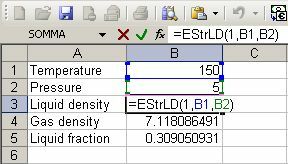 Then enter (in the proper units) the desired range of temperatures (cells B2-B3) and the operating pressure (cell B4) and click on compute button to calculate the data, Prode Properties will print the values with the desired units of measuremebt. In the same page there are a series of graphs which show the different properties at different operating conditions. As you see Properties is a useful tool in everyday work, you can calculate rigorously, easily and quickly many different properties, you can set preferred units, you can define and save many different streams. 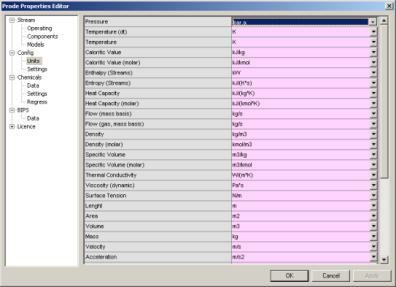 flexible database format (support for up to 30 different correlations) works with all majour standards including DIPPR. additional models as Pitzer, NRTL for electrolyte solutions, PC SAFT (with association), GERG (2008) etc.